On 7 August 2018, EuroCham jointly with other organizations including ASPERINDO, ALFI of Soekarno Hatta, INACA, IATA, US-ABC, AmCham, KoCham, JJC, and few ground handling agents were invited by the Directorate of Technical Customs to evaluate the implementation of Minister of Finance Regulation No. 158/PMK.04/2017 on Delivery of Inward Notice, Inward Manifest, and Outward Manifest. The meeting specifically focuses on evaluation of implementation in the Soekarno Hatta International Airports. The meeting was chaired by Mr. Djanurindro Wibowo (Deputy Director for Import), accompanied by Mr. Anju Gultom (Head Section for Import), Mr. Dzikri (representative from the Directorate of Customs and Excise Information/IKC), Mr. Sumardiono (representative from the Soekarno Hatta Customs Service Office), and other representatives from the Directorate General of Customs and Excise. Based on the evaluation, improvements are required especially in regard to the communication between all stakeholders including airlines, ground handling agents, freight forwarders, postal services providers, as well as the Customs Service Office who will need to reconcile cargo manifest data submitted by each of these stakeholders. Another important aspect that need improvements is that the readiness of customs IT system to allow online submission of the cargo manifest data. Currently slight discrepancies of data may cause the data cannot be automatically reconciled by customs IT system. This would lead to manual reconciliation process by the Customs that would require more time and often storage costs for delay of clearance of inbound cargo. On 24 July 2018, EuroCham had an exclusive dialogue with H.E. Jusuf Kalla and H.E. Thomas T. Lembong. During this meeting, EuroCham applauded the extensive efforts that the Government of Indonesia have taken in improving business climate. EuroCham acknowledged the Government endeavor in simplification of procedures and licenses, including the recently issued Online Single Submission (OSS). EuroCham further appealed for the Vice President support and monitoring on the implementation of OSS, as well as the development of government regulations on Halal and draft bill on water resources. 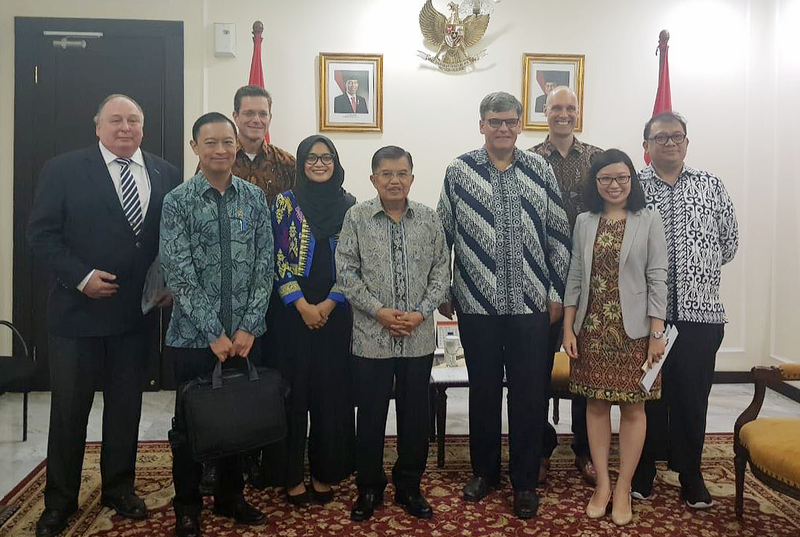 With the ongoing Indonesia-EU Comprehensive Economic Partnership Agreement (IEU CEPA), EuroCham encouraged that the Government prioritizes the completion of said agreement. EuroCham believes that IEU CEPA would promote greater flows of investment between the two economies, as evidenced from the past positive relation between FDI and trade between Indonesia and the EU. This request was acknowledged and was further echoed by Mr. Kalla and Mr. Lembong. Mr. Lembong informed that the Government will focus its resources towards IEU CEPA negotiations. In addition, EuroCham took this opportunity to also convey its gratitude for the engagement on the Negative Investment List (DNI) review process. EuroCham emphasized the request to open sectors within the DNI to invite more foreign investors to enter the country. EuroCham highlighted that the European business presence in the country encourages two-way trade relationship, boosting export and investment. In these regards, EuroCham will continue advocacy efforts by providing feedback and support for the Indonesian Government.